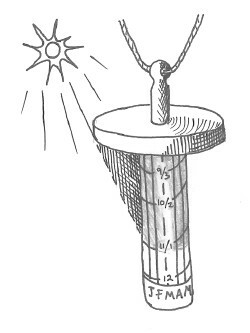 Merry Maker Sir Richard posted this sketch for a portable sundial he's working on. The gradations would be site-specific, but I would imagine they'd be latitude-specific. So while your New York sundial necklace would be off in Quebec, your I-70 sundial would work fine all the way across the country. As long as you take the time zones and daylight savings into account, of course.